It's easy to think all contact lenses are the same when you don't have issues with the brand you wear, but the truth is that every contact lens can perform vastly different under different environments and personal eye chemistry. For people with significant depositing, debris, and comfort issues, daily disposable lenses are always the best answer. Nothing solves the issue like a brand new contact lens every day! But if you are interested in problem solving in multiple wear lenses, certain contact lenses have properties designed to combat these problems. Research by Alcon (the makers of Air Optix Aqua) shows that their lens is one of the best at preventing makeup and oil-based debris from collecting on the lens surface -- a problem experienced by many women as their lenses age over the course of the month. The study above compares lenses at the end of their life span (so Acuvue Oasys was graded at 2 weeks because that is as long as it is approved for versus Air Optix which was judged at 1 month). All of these contact lenses are silicone hydrogel, so we know that depositing is a potential risk. But Air Optix Aqua vastly outperforms the other popular silicone hydrogel lenses on the market with deposit resistance. Not only do makeup oils build up on the lens surface and cause distortion, but makeup removers can also impact the chemistry of your contact lenses. 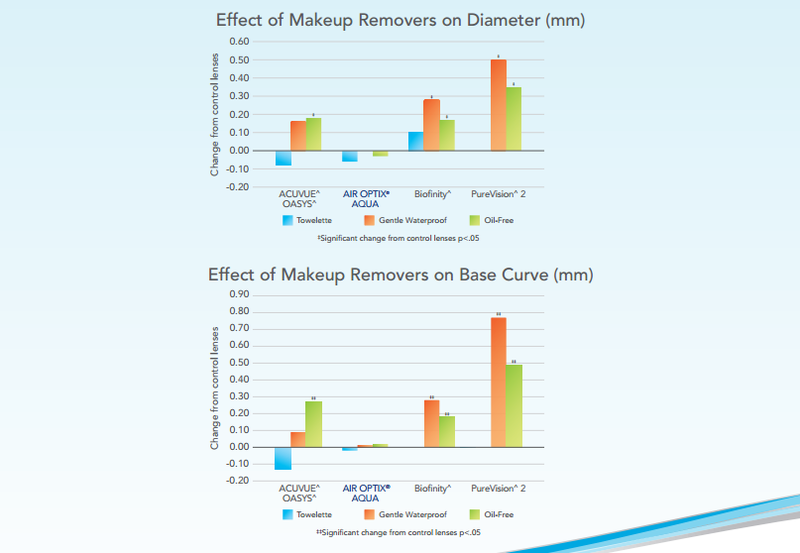 Studies by researchers at Alcon show that oil based and even oil-free makeup removers or face washes can change both the diameter (size) and base curve (curvature) of the your contact lens with exposure. If you have ever looked at the edge of your contact lens and thought it looked wavy or imperfect, you've probably experienced this type of chemistry change. Not only will these changes make your lenses less comfortable, but they would also theoretically affect the vision that you achieve through the lens! 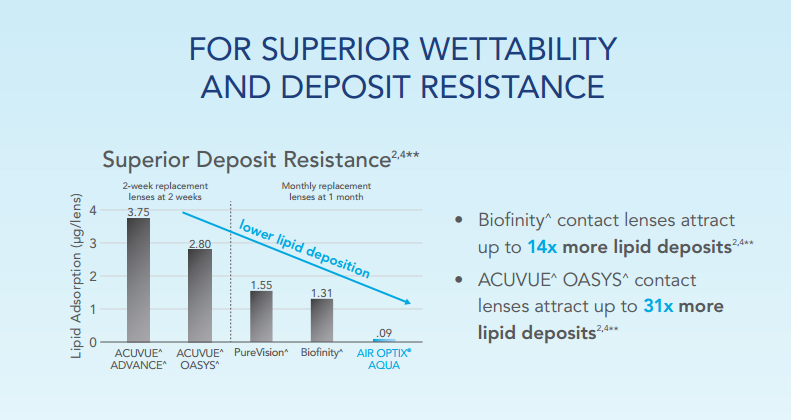 In a comparison of the four major multiple wear contact lenses on the market, Air Optix Aqua has the least amount of change with exposure to these normal skin-cleaning chemicals. Do you want to have comfortable eyes and clear vision? Don't put eyeliner on like this. across your eye and contact lens all day long! Throw your lenses away on time! This should go without saying, but if your lens is a monthly approved lens, never keep it for longer than a month. At this point, all chemical properties of your lens will be distorting and deteriorating, causing reduced performance for comfort and vision, and greatly increasing your risk for infection or permanent damage to the eye!! References: 1. Davis R, Eiden B. Changes in comfort and vision during weeks 3 and 4 of monthly replacement silicone hydrogel contact lenses. American Academy of Optometry 2012; E-abstract 125401. 2. Nash W, Gabriel M, Mowrey-McKee M. A comparison of various silicone hydrogel lenses; lipid and protein deposition as a result of daily wear. Optom Vis Sci. 2010;87:E-abstract 105110. 3. In vitro measurement of contact angles on unworn spherical lenses; significance demonstrated at the 0.05 level; Alcon data on file, 2009. 4. Ex vivo measurement of lipid deposits on lenses worn daily wear through manufacturerrecommended replacement period; CLEAR CARE® Cleaning and Disinfecting Solution used for cleaning and disinfection; significance demonstrated at the 0.05 level; Alcon data on file, 2008. 5. Luensmann D, Srinivasan S, Yu M, Yang J, Jones L. The impact of cosmetics on the physical and optical performance of silicone hydrogel contact lenses. Centre for Contact Lens Research, School of Optometry, University of Waterloo, Canada. 2012. 6. AFM 2.5 x 2.5 micron image; Alcon data on file, 2006. 7. AFM 2.5 x 2.5 micron image; Alcon data on file, 2009. 8. In a survey of 1,607 eye care practitioners; Alcon data on file, 2009. 9. Data on file, Alcon Research Ltd, 2011. 10. Campbell R, Kame G, Leach N, Paul M, White E, Zigler L. Clinical benefits of a new multipurpose disinfecting solution in silicone hydrogel and soft contact lens users. Eye Contact Lens. 2012 Mar;38(2):93-101. This is really interesting. As a contact lens wearer and makeup applier, I think I've been guilty of applying my eyeliner like you say not to. I'll definitely stop that, as I really want to take better care of my contact lenses. Thanks for the helpful advice! 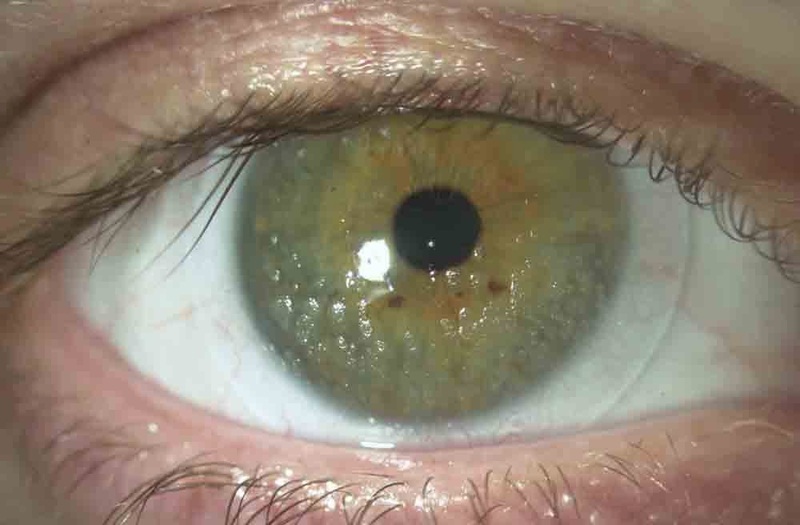 Many studies are showing that bacteria along the eyelids is a leading cause of corneal infections with contact lenses, not to mention that around 15% of contact lens wearers each year have to stop wearing their lenses due to discomfort, dryness, and visual distortion (which is often impacted by debris and drying out of the lens surface!). Taking care of your eye and eyelids can really help keep you in contact lenses comfortably for years to come! The particular eye continues to be called essentially the most intricate body organ within our body. It really is remarkable that one thing so little might have so many doing work elements.Although the fact that precisely how tough the work of delivering eyesight really is,perhaps it really is absolutely no ponder in the end.